Albany Cycles has been owned by its current propietor since April 2001, at which time it was a small retail premises specialising solely in Mountain bikes. Since then the business has grown due to the ever increasing demand for quality cycles, components and repairs. Due to demand, Albany Cycles expanded to employ a full time mechanic from 2005 onwards and a part time technical mechanic from 2008 to assist with the high turn over of cycles and repairs. By 2010, the business had out grown the old premises at 199 Albany Road. The opportunity arose to relocate the business to its current location at 201-203 Albany Road, where we have been since November 2010. The current premises is over four times the size of the old shop, which allows us to stock a bigger range of, not just, Mountain bikes but Road, BMX and Hybrids bikes. A new, and considerably larger, workshop was created which includes better facilities to cope with the ever growing demand for servicing all aspects of a bike. With your ongoing support, Albany Cycles continues to grow as an independent retailer, whilst providing excellent customer service and maintaining our standing as Coventry's premier cycle shop. Simon has owned Albany Cycles since April 2001, in which time the shop has gone from strength to strength - increasing its stock, employees and workshop facilities. 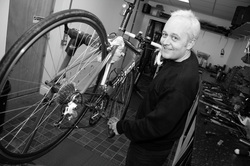 In October 2010 he moved Albany Cycles to its current premises on Albany Road in Earlsdon. He now predominantly rides XC and Downhill, however he started racing in the youth category at age 14, having only been riding for a year previously. Since then Simon moved from Junior to Sport to Expert categories with a string of successes under his belt. Amongst his proudest achievements, alongside 12 top 3 places within XC racing, Simon was UK Diamondback Junior Champion in 1995.
matching of rider and bike. 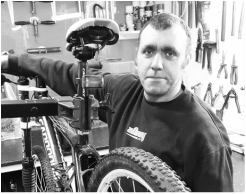 Neil started working at Albany Cycles in 2005 and currently focuses his efforts on servicing bikes. A keen cyclist, Neil has a passion for Road bikes and Fixed Gear cycles. Having worked in the bike trade for over 10 years there isn't much about bikes he doesn't know. Having married in 2009 he had his first child in September 2010 and his second in November 2014. 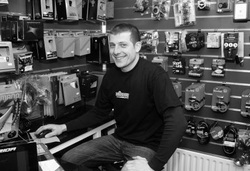 Mick joined the Albany Cycles team in 2008 to meet the growing demand for services, repairs and custom builds. He has worked in the bike trade for over 15 years. He is the technical guru at Albany Cycles and specialises in hydraulics and suspensions. Mick enjoys both Downhill and Road cycling, but struggles to fit in as much riding as he would like due to his other passion - sound engineering. Rosie joined us in the summer of 2013 as a half stray. Not being liked by the other cats she had been living with she found her way into the work shop to sleep on the central heating boiler. She is now very much part of the team and is loved by our customers who come in to fuss over her. We would like to think that she is a vermin destroyer but she is more of a sitter and a looker.